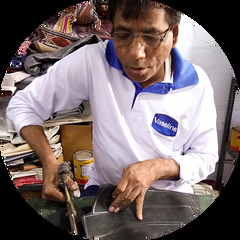 Rethinking one of their popular tire bags, Indian craftspeople used lots of misprinted leather jeans labels to create this functional bag with bicycle tire accent. The flap closure is secured by Velcro. Lined in black nylon fabric, the inside has a fabric pocket, cell phone pocket and a few pen pockets. Dense cotton fabric strap adjusts to up to 50 inches long. The bag is 13 by 12 inches with a 4-inch side gusset.